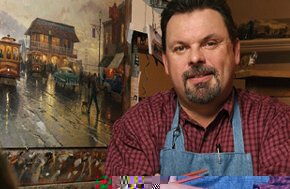 “Painter of Light,” Thomas Kinkade (January 19, 1958 – April 6, 2012), was widely regarded as one of the foremost living painters of light and has also become known as ‘America’s Most Collected Living Artist’. His use of light and the unique ability to capture the timeless essence of a fleeting moment whether cottage or countryside, small town America or bustling city have made his work extremely popular the world over. Thomas Kinkade was born in 1958 and from an early age his talent as an artist was evident, and by 16 he was an accomplished painter. He studied at the University of California at Berkeley, and later at Art Center College of Design in Pasadena, California, and on leaving he began work painting for the motion picture industry. 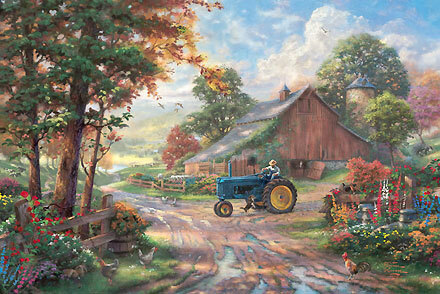 In 1983, Thomas Kinkade left the film industry to pursue his vision as painter of light-filled landscapes. Since that time his reputation grew and perhaps no American artist since Norman Rockwell has received such broad exposure and popular acceptance. The following generated by this immense exposure has brought six digit sums for Kinkade’s original paintings and an ever widening list of prestigious collectors, including many well-known leaders in the fields of politics, business and entertainment. A devout Christian, and family man, Kinkade readily acknowledges God’s hand in his life and well aware of his many blessings, foremost are his wife Nanette and his four dauhters. Collectors know that Thomas Kinkade hides “N’s” in his paintings as a tribute to Nanette, while his daughters often find their images and names in his works as well. 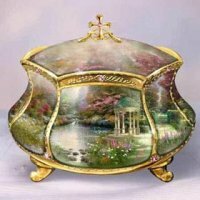 As well as painting his extraordinary artworks have become the inspiring focal points for an amazing selection of Thomas Kinkade collectibles. 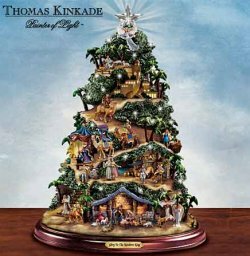 Virtually everything Kinkade paints gets reproduced in one or more forms, including hand signed lithographs, canvas prints, books, posters, calendars, magazine covers, cards, collector plates, figurines, villages, electric trains, heirloom quality clocks and many gift items. The Thomas Kinkade Collectors’ Society enables collectors to learn more about Thomas Kinkade and his work through the club magazine The Beacon, as well a number of other members-only benefits which include: gift certificates, a membership card, lapel pin and exclusive offers.